Whether through our custom cutting services or by providing a wide variety of North American hardwood veneers, we strive to offer customers first class quality and service in everything that we do. Custom Cutting is the core of our business and we look forward to serving any needs that you might have. Our staff combines decades of product knowledge with modern equipment to produce a high quality product. Our experienced sales staff provides a variety of veneers for customers from all over the world. Please reach out with any veneer inquiries. We buy quality North American hardwood veneer logs. Please reach out to our log buyers, Scott and Hans, with any inquiries. 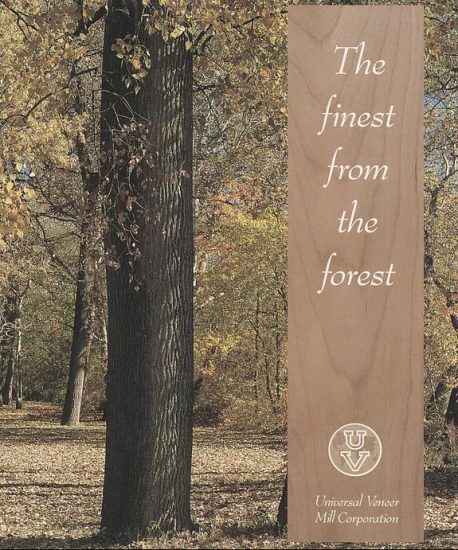 Universal Veneer was founded in September, 1978 by Carlo Iseli in Newark, Ohio and later acquired by partners Dieter Heren and Klaus Krajewski in 1988. Newark was chosen due to its centralized location and proximity to quality timber resources. Universal Veneer has been a staple in the local community since its founding and has provided employment and opportunity to many. Mr. Krajewski is now the sole owner of the Universal Veneer Group of Companies and has served as President since 1986. Universal Veneer continues today with an experienced staff and also an eye towards to the future as we strive to continue to grow and provide quality veneer services well into the heart of the twenty-first century. An unwavering focus on providing a high quality product and putting our customers first has enabled Universal Veneer to have the sort of longevity and success that allows us to continue to operate and grow. We are working today to maintain and build relationships with customers all over the globe and provide them with the finest American hardwood veneers and custom slicing. In addition, we are constantly investing in new machinery to ensure that safety and quality are never compromised as we head into the next generation of the hardwood industry. Universal Veneer believes that protecting the Earth and its natural resources should be at the core of all our endeavors. Because of this, we practice sustainable forestry methods and work closely with environmental agencies to ensure responsible wood procurement. Our number one focus is producing veneer to the satisfaction of our customers. We strive everyday to provide a service that you can be confident in. Reach out to our experienced production staff with any inquiries. Universal Veneer serves markets all around the world—from right here in the United States to Europe, Asia, and the Middle East. Wood is a product that has a natural beauty that knows no borders. Customers from all over the globe can take comfort in our decades of experience in dealing with international trade. We are a team of goal-oriented individuals with a focus on putting the customer first. We take great pride in manufacturing a quality product right here in America and are constantly striving to better serve our customers and also our community. Whether you are looking to produce veneer, buy veneer, or join our team–we encourage you to explore our webpage and reach out to us with any questions. © 2019 Universal Veneer. All Rights Reserved.